Here is an Aloxite Carborundum barber hone. From what I know this was used for the old school razor blades. 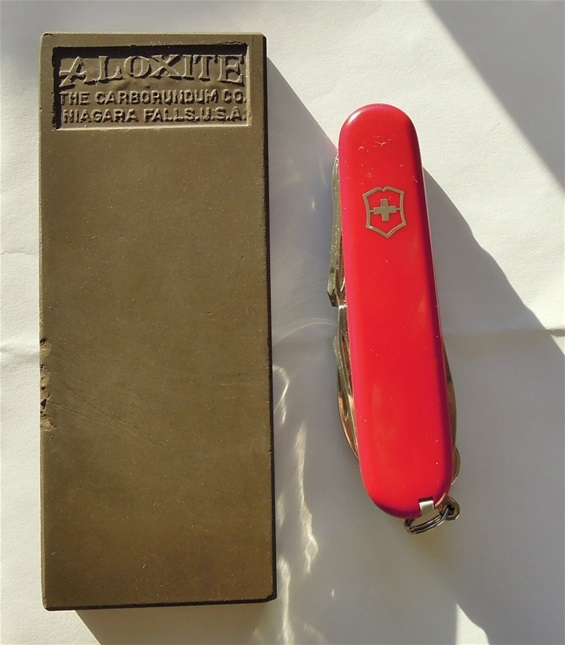 I have used this a few times because it got a very fine surface that can be used on Swiss Army Knives. 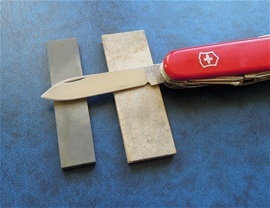 The stainless steel used on the Wenger and Victorinox knives are very fine and surfaces like this Aloxite stone brings out the razor sharp edge. Either this stone came with grease from the factory or people have greased it later. It can be used wet or dry. It is fully possible to use a few drops of water on the surface of the stone. I love to sharpen by hand and it is fun to use old sharpening stones. I am not fully sure about the age of this stone yet. I would believe it is several decades old for sure. These were produced in big numbers for a long time from what I learned so far. The surface is so fine it can be used in the last step when sharpening your knives or for touching them up. I would not recommend boiling out the factory grease in these stones because it is probably too deep into the stone. No point of damaging the stone. Just remember to clean the blade after sharpening if you are going to use it on food stuff. If you read my articles on sharpening you already know that with sharpening it is never about using much pressure. It is better to use light pressure and take some time. When you bring out the preferred sharpness you can in the last strokes use a sharper angle. If you see the barbers then they often strop the blade on leather. This is no point of doing in that fashion on Swiss Army Knives. There are several reasons for this. One is that old school leather stropping may damage the edge on SAKs. On the larger knives 111 and 130mm there could be nice to do a few strops because it is a more sturdy edge. If you are going to use leather stropping on any SAKs in my opinion it is far better to glue some leather on wood. It gives a better control and you will avoid the edge folding. Use light pressure to polish the edge or remove burrs. Remember what I mentioned with pressure because this goes for steels with harder HRC too. SAKs are extremely easy to sharpen. I can explain some more about old stones and that in time you will get much remains and oil in them from use. Use some soap and warm water and a brush then rinse it. That is all that is needed. Remember that old stones sometimes came with a substance or grease that was fully soaked through the stone. This is to preserve the stone and probably for the sharpening process as well. This you can see when old stones are in the original box and that the stone is wrapped in a special wax paper. You can also smell it. I prefer the width of the stones to be like the Arkansas one. The other one is a Carborundum stone. These are very good even if it is a bit narrow. They are very useful to bring along. I always use fine stones but for sure fine-medium can be used with good results. Usually with such small stones you only use them to touch up an edge or maintain it. Remember no violence with knives and learn how to get away from such a situation or defend. Remember that small stones usually convex the edge, this you can especially see on Scandi grind knives. Natural stones and Carborundum stones you use water or oil.